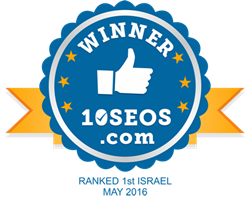 10seos.com has come up with the list of top 10 SEO service providers in Israel. Wisy has been ranked first in the listing. The company has been providing exemplary services since its inception. Search engine optimization is an ongoing process, hence the companies should keep with the changes in the digital market. Wisy strictly abides by the same concept. 10seos.com helps a lot of businesses in selecting best company form a pool of service providers. It believes that search engine optimization is an important process for any business. Hence it takes out those names that provide genuine and best services. The highlighted companies in the list of 10seos.com are not only performing well but also doing same for a long time. The registration process on the portal does not confuse users like any other reviewing segment. It does not include big forms. First twenty registration on the portal of website of 10seos.com cost nothing. The offer remain valid until it completes first twenty registrations. After successful registration, the companies are verified. The verified companies are provided with badges. 10seos.com has framed a rigorous evaluation method so far. Every month, a lot of companies are put to test and best names out of the pool are highlighted on the top ranks in the listings of 10seos.com. 10seos.com is one of the finest rating and reviewing segments in the world. It rates and reviews best SEO firms in the world. A lot of businesses rely on the services of 10seos.com. The users can choose best SEO Company form the listing of 10seos.com. First twenty registration on the website of 10seos.com are free. The companies are then verified and provided with badges. The team of 10seos.com comprises of SEO geeks and a lot of marketing specialists. Vendors that are included in the lists of 10seos.com, can display their winner seal on their websites. The reviewing segment 10seos.com helps genuine vendors grab more and more customers.